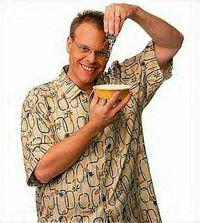 Alton Brown (born on July 30, 1962 in Los Angeles, California) is the creator and host of the television show Good Eats, a cooking show on the Food Network. He is often described as a culinary version of Mr. Wizard or Bill Nye because he brings a scientific and humorous approach to his cooking shows. Bon Appétit magazine named him "Cooking Teacher of the Year" in 2004. He is the main commentator on the show Iron Chef America, an American adaptation of the Japanese series Iron Chef. Alton is also a regular contributor to Bon Appétit and Men’s Journal magazines. Prior to his cooking career, he received a degree in drama from the University of Georgia. He then worked in cinematography and film production. In that field, he is probably best known for his work as the director of photography for the R.E.M. music video The One I Love. At some point he noticed that he was very dissatisfied with the quality of cooking shows currently airing on American television, so he set out to produce his own show. Not possessing the requisite knowledge, he enrolled in the New England Culinary Institute, from which he graduated in 1995. Brown states that he had been a poor science student in high school and college, so he began to study the subject as he took cooking training and felt the need to understand the underlying processes of cooking. The pilot for Good Eats first aired on the Chicago, Illinois PBS member station WTTW-TV in July 1998. Food Network picked up the show in July 1999, and as of 2006, still airs new episodes. Brown seems to take particular delight in making tongue-in-cheek references to pop culture in his episodes such as an episode on hamburgers in which Brown lectures an actor dressed as cartoon character Wimpy (although not named as such for copyright reasons). In 2004, Brown appeared on Iron Chef America: Battle of the Masters, the second attempt to adapt the Japanese cooking show Iron Chef to American television (a previous adaptation featured William Shatner and was not well received). Brown served as the expert commentator, a modified version of the role played by Dr. Yukio Hattori in the original show. The show was extended with ten new episodes, advertised as both "New Battles" and "Season 2", which started July 10, 2005. As the expert commentator, Brown is usually heard throughout the episode explaining to the audience what the competing chefs are doing, able to identify most cooking techniques and explain them long before anyone watching can. Occasionally, the camera will cut away from Kitchen Stadium to show Brown as he explains something about the secret ingredient, such as the different sizes and types of shrimp or clams. Brown rarely makes mistakes about his information, although he once mistook the green contents of a squeeze bottle to be a garnishing sauce when it was in fact soap. Careful listeners might note changes in sound quality between some of Brown's comments in the show. This probably indicates dubbed comments, recorded after the conclusion of the live "battle." This is not unusual for shows recorded live, where loud noises often drown out voice commentary, which have to be re-dubbed in studio. Alton's third series, a limited run series entitled Feasting on Asphalt, explores the history of eating on the move. In a quest to find "good eats" across the country, Alton Brown embarks on a transient mission via motorcycle ("As far as I’m concerned, there’s no better way to experience the road than from the back of a bike," according to Brown) to find tasty edibles on the go in a 4-part series about the history of road food. Alton will sample food all along his travel route, often sleeping under the stars between meals. In his traditional style, he'll include the usual "history of food" segments documenting famous road trips (from the Odyssey to the Crusades, to Lewis and Clark, and Jack Kerouac) and interviews with many of the "foodies" he meets enroute. Alton begins his trip in Marietta, Georgia (where he currently resides), then winds his way through the Great Smokey Mountains, Missouri, Kansas, Oklahoma, Texas, New Mexico, the Rocky Mountains, Utah, Las Vegas and the California coast. The series premieres on Food Network Saturday, July 29, 2006 at 9:00 PM EST/PST, with subsequent episodes airing the following 3 saturdays (August 5, 12 & 19), also at 9:00 PM EST/PST. Currently, Alton Brown lives in Marietta, Georgia with his wife DeAnna, daughter Zoey, a basset hound dog Matilda, and an iguana. A few members of his extended family have appeared in Good Eats (such as his late grandmother, Ma Mae, and daughter, Zoey), but most of his "family" portrayed on the series is made up of actors and the show's production crew. Earlier, he had another basset hound, but this second dog has since died. Brown loves apples — not only the fruit, but also the computer company, Apple, as he was interviewed by Macworld magazine. Additionally, Brown frequently features Apple-branded computers on Good Eats. Although the Apple logo is usually masked, the computers' unique appearance makes them quite noticeable. He is also a connoisseur of cheese and a motorcycling enthusiast. Alton Brown will be the keynote speaker at the 2006 Institute of Food Technologists Annual Meeting & Food Expo on June 25 in Orlando, Florida. On May 5, 2003, his first book, I'm Just Here for the Food, won a James Beard Foundation Book Award in the Reference category. He will be releasing a "5th Anniversary" edition of the book entitled I'm Just Here for the Food: The Director's Cut, due out in October 2006 from publisher Stewart, Tabori & Chang [publisher of all of Alton's books]. According to Alton's official site, this revised edition features ten new recipes, 20 pages of additional material, a jacket that folds out to a poster, and a removable refrigerator magnet.